I live near Madison, WI. As you may know, a lot has been going on here lately. I do not write about political issues here on Sites and Stories. It’s been fascinating, though, to think about the historical context and connections of the current budget battle. 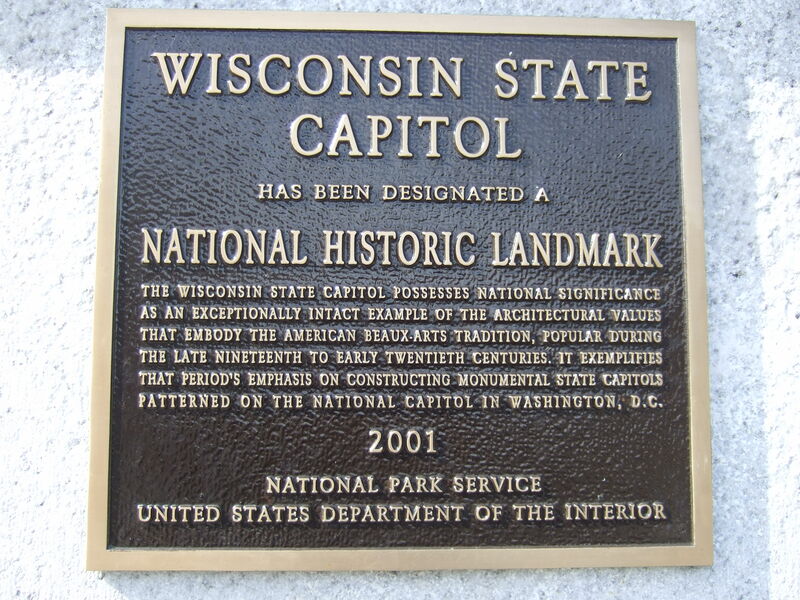 Wisconsin's current capitol building dates to 1917. It replaced a structure destroyed by fire in 1904. 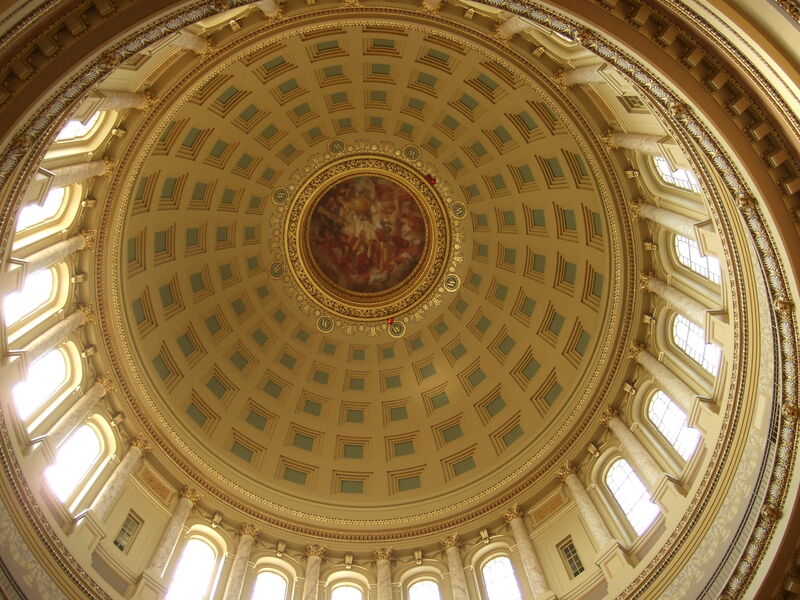 Wisconsin’s capitol building is gorgeous, and a source of pride for both people who work there and citizens who visit. 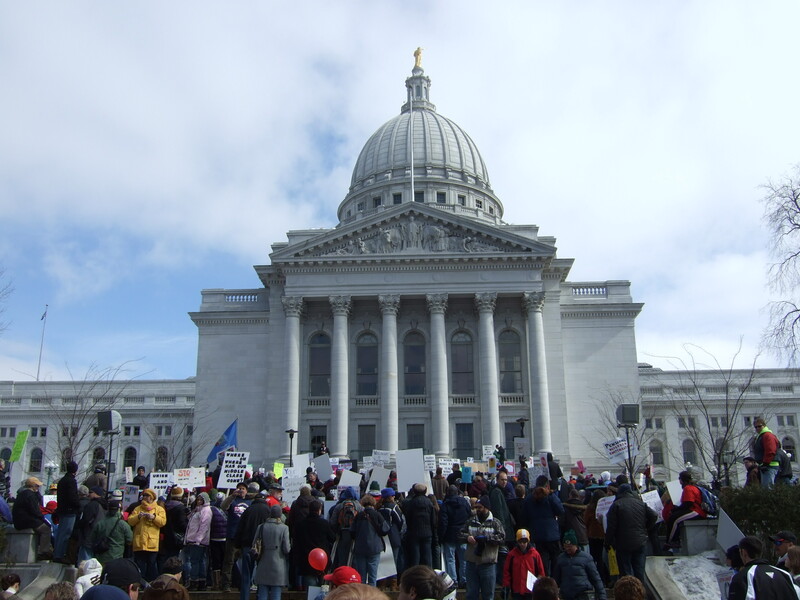 Protestors outside the capitol, March 6. And when protests began two weeks ago, people moved in. They were peaceful. They were also passionate. This was their house. It's been moving to see democracy in action within this beautiful old structure. The building’s layout and design are perfect for protest. The walls became a gallery for signs and statements. The sounds of chanting and singing and drumming echoed beneath the dome. A glimpse of the dome. A statue of “Fighting Bob” La Follete sits on the second floor of the capitol. 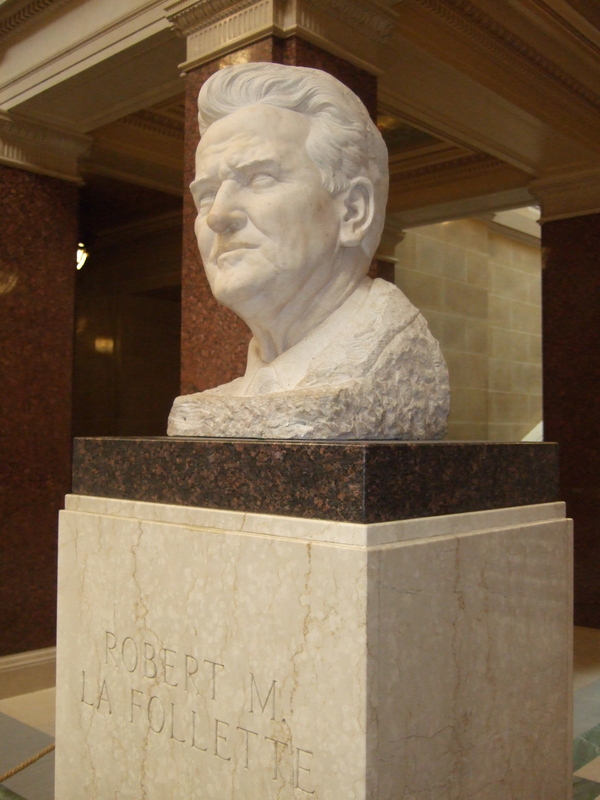 La Follette has long been revered in the state as a brave and honest politician, willing to risk ostracism rather than compromise his beliefs. Fighting Bob would surely be pleased to see so many citizens engaged in affairs of the day. 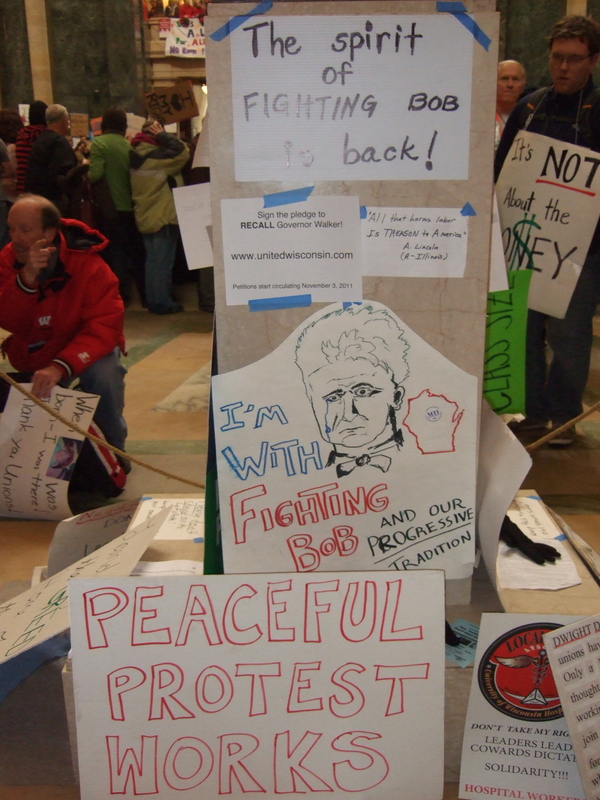 Bob's memorial became a rally point during the protest. I love seeing so many families engaged. 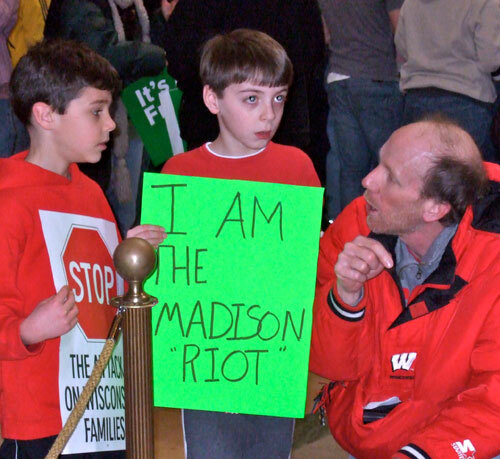 These two young protestors were learning what the La Follette memorial was all about. What a civics lesson! For a few days the building itself was locked to visitors, and the protestors gradually moved outside. A police presence remained inside, including many officers from distant parts of Madison. I read that one person who works in the capitol started giving building tours to officers. 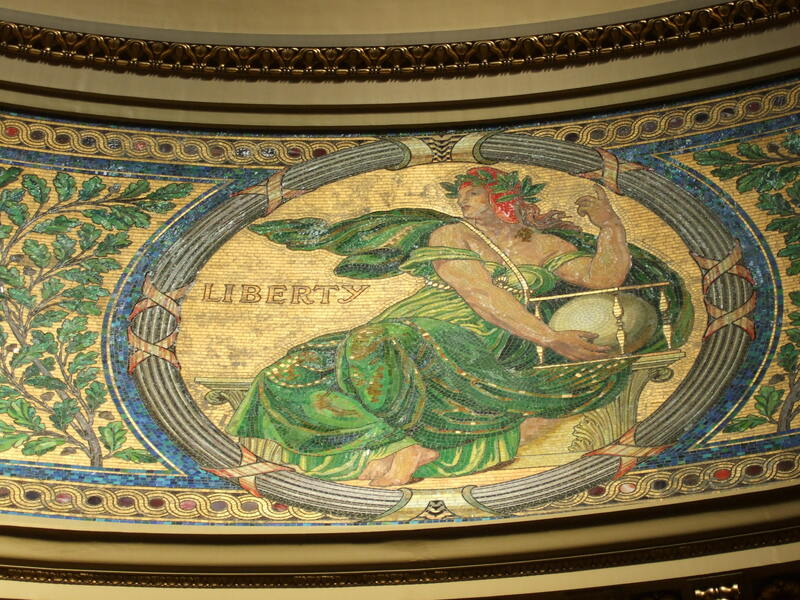 One of the many tile mosaics. History has been invoked by many involved in the ongoing protest. I’ve heard students speak knowledgeably about the 1886 protest in Milwaukee. 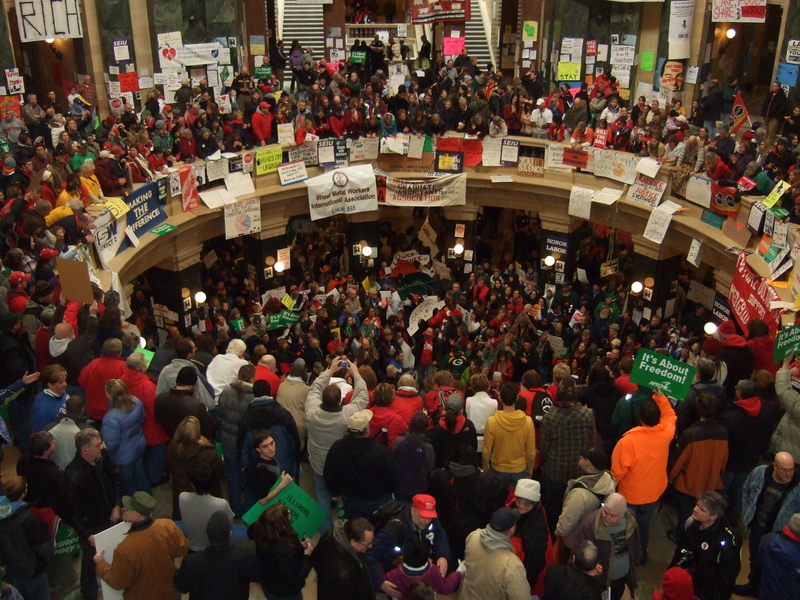 Workers were fighting for an eight-hour work day. The governor called out the national guard and seven people were killed. I am reasonably knowledgeable about Wisconsin history, but I knew little about that tragedy. I’ve heard college kids say that they knew nothing about labor history until this current crisis prompted them to talk with their grandparents and learn more about it. The current political stalemate is a tragedy. If there’s a thin silver lining, perhaps it’s that the debate has prompted many citizens to re-engage with our state’s history, and to visit the capitol building with a renewed sense of purpose.